The last of the Kawahiva are forced to live on the run from armed loggers and powerful ranchers. This still is from unique footage taken by government agents during a chance encounter in 2015. Brazilian authorities have completed a rare ground operation to protect an uncontacted tribe from violent ranchers in a region of the Amazon with the highest rate of illegal deforestation in the country. But there are growing fears that unless the remaining steps in the land protection process for the tribe are completed quickly, the territory will never be secured. Agents from Brazil’s indigenous affairs department FUNAI, Environment Ministry special agents and police officers were dispatched to remove the illegal ranchers – many of whom are armed – from the Kawahiva indigenous territory known as Rio Pardo, in Mato Grosso State. The operation took place 7th-14th December. 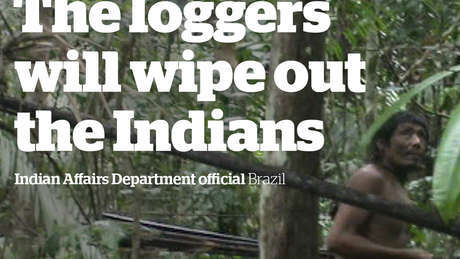 Details of the operation were released yesterday by FUNAI, the Brazilian government’s Indigenous affairs department. The Kawahiva’s territory lies near the town of Colniza, one of the most violent areas in Brazil. 90% of Colniza’s income is from illegal logging. The Kawahiva are nomadic hunter-gatherers, living on the run to flee the invasions of their forest home. The remaining members of the tribe are survivors of genocidal violence by invaders exploiting the area’s natural resources. It’s likely the tribe avoids contact with mainstream society due to these attacks, as well as the fear of disease brought in by outsiders. Proper protection of their land is the only way to ensure their right to choose not to make contact with the outside world is respected. But President-elect Jair Bolsonaro has pledged not to protect any more indigenous land, and campaigners fear that unless the Kawahiva’s reserve is fully protected before he takes office, the process will never be completed. The Kawahiva became well known in October 2015, when Survival International released footage of a chance encounter with members of the tribe filmed by FUNAI. These images remain some of the most astonishing footage ever seen of uncontacted people. The Kawahiva were caught on camera in a chance encounter with FUNAI agents. 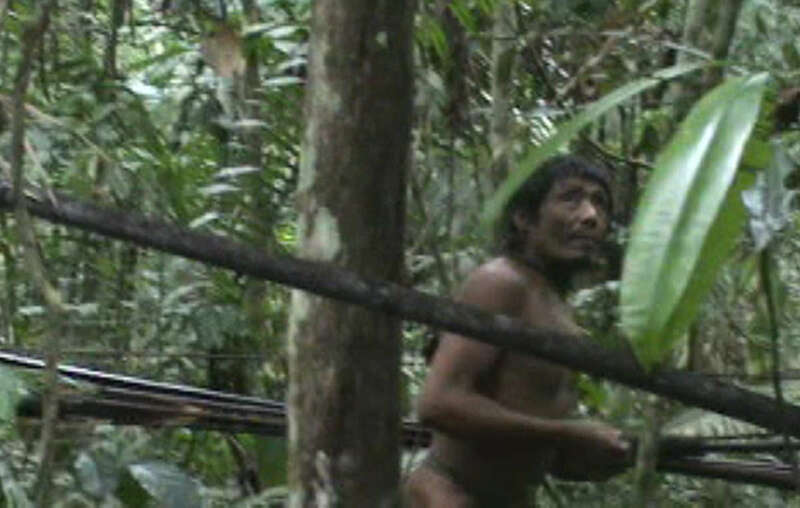 This is some of the clearest footage ever captured of uncontacted people. The process of securing their land began some years ago when the existence of the Kawahiva was confirmed, and the government began to map out their territory for their exclusive use, as is required by national and international law. However, this soon came to a stand-still, leaving the Kawahiva exposed to genocide and extinction. Survival International, the global movement for tribal peoples, then led a successful campaign to demarcate and protect the territory. Fronted by Oscar-winning actor Mark Rylance and backed by supporters in over 100 countries, Minister Eugênio Aragão signed the initial decree creating the protected territory for the tribe into law on April 19th 2016. As part of their global campaign to ensure the protection of the Kawahiva’s land, Survival released a short film narrated by Mark Rylance, who spearheaded the campaign. In the intervening years, councilors from Colniza have lobbied the Minister of Justice to drastically reduce the size of the Rio Pardo indigenous territory, to allow more loggers, ranchers and soy farmers to move in. However, two years after the decree was signed, the authorities have now removed the invader. - There are more than one hundred uncontacted tribes around the world. They’re tribal peoples who don’t have peaceful contact with anyone from the outside world. - Uncontacted tribes aren’t primitive relics of a remote past. They are our contemporaries and a vital part of humankind’s diversity. They are aware of the outside world, and may engage sporadically with contacted tribes nearby. - Uncontacted tribes are the most vulnerable peoples on the planet. Whole populations are being wiped out by violence from outsiders who steal their land and resources, and by diseases like the flu and measles to which they have no resistance.